~Polish Freshie~: Water Marble Success! 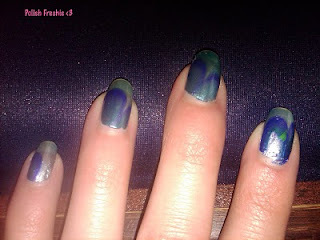 So I tried water marbling a second time but didn't get a photo :(. They were very erratic and I used white as a base coat and missed the colors entirely when dipping some parts of my nail in the water. My biggest issue with perfecting the technique was not putting the same amount of each color in the water in the same pattern and not paying attention to the type of pattern I was drawing each time in the water. The third time I tried this technique was certainly my best! I used all Sinful colors thinking using the same brand may provide better results. Colors: Tokyo Pearl, Gorgeous and Let's Talk. I used a coat of Toyko Pearl as a base. There is one crazy dot of Sinful's Neon Melon on my pointer finger from painting my toes but other than that they looked fabulous and I received lots of compliments. I also must confess I hadn't ever used a base coat and of course always had horrible chipping. I've been using Sally Hansen's Diamond Stregnth No Chip Basecoat and it seems to be doing the job. 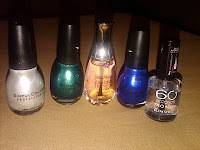 I had also been using Rimmel's 60 Seconds Clear Top Coat because I can't stand sitting around staring at my nails dry. Keep at it ladies and you'll start getting this down - I promise. I like it. The middle one sort of looks like the Earth :) I haven't been brave enough to try marbling yet.